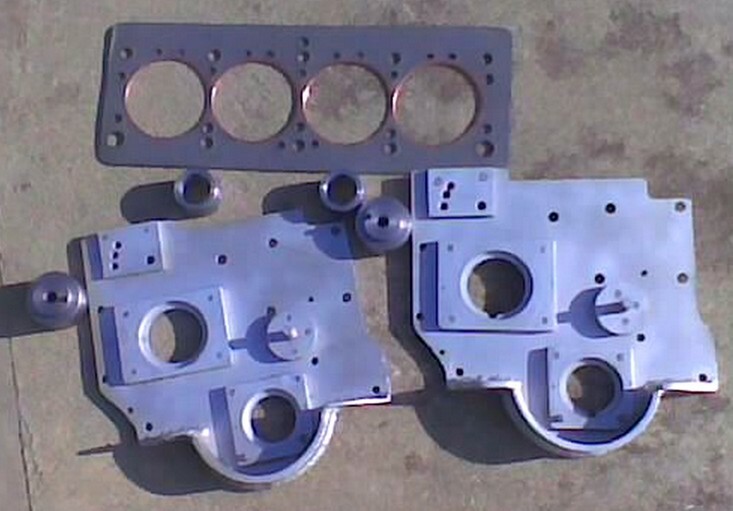 After much stuffing around, I finally got a quote from a local CNC place to get my twin cam OHC adpator plate copied. $1200-$1400 for each plate, plus a $650 fee for making the drawing. When I asked if I could get the dxf from them as well, they said that it was an extra cost. So how about F**K off then.... I was plesent on the phone, but ill be collecting the plate this week. Even if that is a fair price, $2000 to get a plate copied is exorbitent! No one could afford that. I didnt pay that much when i bought my one from the original designer! So, does anyone know of a place that can copy my adaptor plate in Perth or surronds for a reasonable price? I was expecting in� the range of $100-$300 for each plate, not $2000! Its hidden in my build thread somewhere as well. Its about the size of an a4 page. I have since have 2 guys on crackbook contact me intrested in doing the job so i am in negoiation with them currently. Do you have a good contact Neil? Im in Creswell Oregon and I can machine those plates. PM me. you want me to hook you up with a kit? Im making a kit up for D to send over - you want one to? Not sure on price, but it will be at cost - I didnt do the hard work, so it would be unfair to make anything. needed for the oil pump cover to take the toothed belt pulley? I would be keen for one as well. Nothing like a side project. Reubs you could prob use what I did for a better more complete guide? close to the strength of the Mazda B6 engine in which by co-incidence? series of engine block with freedom in the head department. modifications that are really crazy to get maximum hp for the dollar. I suggest the A14 and A15 block to use the stock B6 pistons which are 78mm and perfect 2mm overbore for those engines which leaves plenty of rebuilds. Whichever B6 twin cam head you use its doesnt matter as long as you can run 2 exhaust cams! There are many 1.6 making 160hp atw using OBX cams, milling head 2mm!, racing beat headers, sports cat, 45mm webers with Rowland inlet manifold (only 168aud plus 40aud landed!) and ecu to run ignition only or cheap megajolt crankfire ignition. Same mods on a 1.8 Bp yields just 172bhp atw only 12hp more for 200cc extra. Im sure no one would complain of this head how it would look on an A series bottom end! Im picking up the plate thie evening again for a local quote from a private guy who does custom stuff in his shed. Lets see what he does as locally is always going to be eaiser to manage. I have a modified bottom pulley that hasd a toothed cog fitted up as well to drive the belt. Im struggling for time on this project in general, but I am aiming for the end of the year to have the engine built and running in my test bed setup. Like I said, once I have a copy of my plate and the bottom pulley, ill start to assemble my motor. just so everyone knows, this is highly experimental, and no warrenties implied or given. If you buy a kit from me, its at your own peril. Im happy with it and how it all works, but there is no warrently implied or given. D, you are first off the rank, followed by Neil. So an update on the machining. Found a guy, reasonably local to me (only 30 mins away) who is more than reasonable. 2 cartons to copy/draw up the plate. he normally only charges 1 carton for drawing, but he said he will use his fancy drawing machine due to the complex nature of the plate. $60/hour on the milling machine - he reckons about 4 hours work. The biggest cost is the slab of alloy - he said that perth is Ul;tra expensive for alloy. He has a contact with an werospace company on the east and he gets his alloy in at about 50% of the cost, delivered to his door. As long as I am happy to wait for him to arrange an order, then its as cheap as it gets. he reckons about $300 for the alloy. So it will cost about $550-600 for the plate. Thats the best price Ive seen locally. What else do we need besides the plate ? Reuby can you tell me the dimension of the 6061 Aluminum needed? I would like to get a material quote for you. The plate is currently with another gent but its about 40mm think and about an a4 page in size. Without the item i cant give you a mm perfect spec. Is that enough for an estimate? 1.5� x 8.25� x 11.75� 6061 Aluminium. I will get a material quote on this. why does it have to be 1.5 (40mm) thick? The thickness is because at the bottom of the plate there is a ~40 mm protrusion. Most of that 40mm plate will be machined off everywhere else unfortunatly. If you look at the image above, look at the curved bit under the second hole. Those images above were version 1 - welded and made up. My plate is version 2, and its machined from a single piece. On another note, the bottom pulley I have is currently a single vbelt with a cogged pulley (to run the cams) bolted on. I will be getting this copied as well. Do you think its worth getting this machined to include a double pulley? Do you think its work asking about gettting a dampner fitted? (ie a rubber internal ring?) I know that factory they dont have one and if you motor is balanced properly, its probably superfolous. Through a local metal outlet.